Before I begin, I'm assuming that you know what a virtual world is. If not, you should read the page on Virtual Worlds first. Also, if you are just trying to log in to the current Irukandji world, the landing sim is Arius on the DigiWorldz grid. If you don't have a virtual world viewer, simply download either the Firestorm, Alchemy or Singularity viewer. What is the Kingdom of Irukandji? Irukandji is my attempt at creating utopia. It is a continent of tropical islands and seas 'somewhere in the South Pacific'. The nation began in ancient times as a loose collective of neighbouring but warring tribes. It was then colonised by the British who spent a century searching for its fabled 'pool of gold'. They failed in their quest, and after decades of rebellion, Irukandji gained its independence. Civil war soon followed, with the Pinjarran tribe seeking to dominate the islands, but the rest of the kingdom united against them and the Pinjarrans were defeated. Today, the Kingdom of Irukandji is self-sufficient, made wealthy by its huge gold reserves. Its wealth and high quality of life for its residents has made Irukandji a significant stabilising power in the South Pacific. It is decent and generous to its less fortunate neighbours, and in return, it is respected. While Irukandji was not created to make any particular political statement, I've come to realise in recent years that I indeed modelled Irukandji to solve the problems in the South Pacific that Australia should be solving, such as poverty, rising sea levels, lingering colonialism etc. Why did I create the Kingdom of Irukandji? It was an accident. I'm an artist who was bored with painting. I was attracted to virtual worlds in the hope of finding a new artistic medium. Reclusive by nature, I went there solely to create. It was 2006. The only virtual world option back then was Second Life, so that's where I began. I liked that the avatars had a manga-esque quality that was very similar to my painting style. And so I started creating. I didn't realise it at the time, but I was already beginning to create a new world. At the outset, I hadn't expected that I would meet other people in there, that they would come to see my creations, but they did - hundreds and then thousands of people from all across the world. And we'd talk. Some wanted to stay, to live on the islands I had made, to live on my artistic canvas. So I created a continent on which they could build a home. I called the new continent Irukandji, named for the tiny jellyfish of North Queensland. 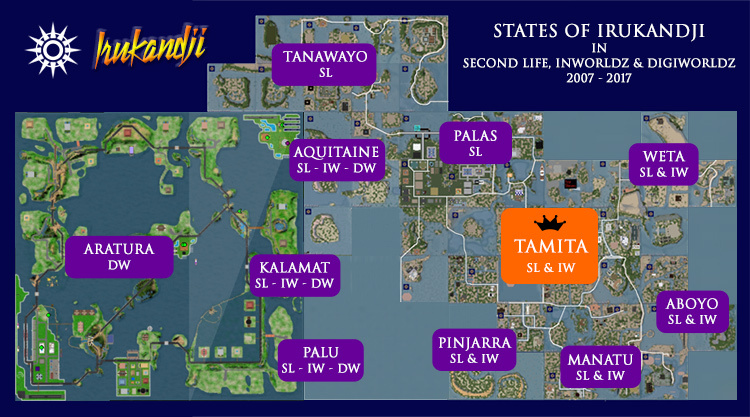 That's how I saw the new continent, as something very small within the much larger virtual world of Second Life. 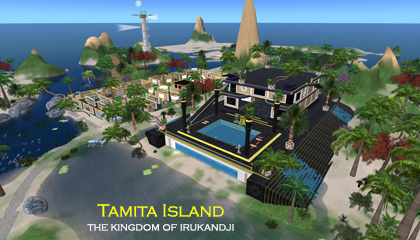 The main sim, Tamita Island was the jellyfish bell, with each island and sea that stretched out from it, another tentacle. When Irukandji first started to look like something vaguely coherent, virtual worlds were quite conservative in nature. Extremist right wing groups, religious nutters etc were rampant. So when I came along with my liberal attitude and don't-give-a-damn approach to uptight folk, I attracted all the marginalised folk of the metaverse. Not surprisingly, at a time when homophobia in particular was rampant throughout much of the world, Irukandji became THE gay enclave in Second Life. I happily ran with that and camped the place up completely. Some of the island names were so overtly homosexual and in-your-face that I'm surprised I got away with it. I mean, really - Weta Rim? Tongabuti Bay? Upper Aboyo Passage? Over the years, as the world settled down a bit, the emphasis on being a gay-themed estate became less relevant. The need to protect the population wasn't as great as it had once been. Average every-day people moved in, thinning out the population and Irukandji became a little more suburban. I was happy with that too as I've never liked enclaves. Always at the core of Irukandji's culture though, was freedom of sexuality. Our motto pretty much summed up the mindset: Freedom, Peace, Integrity. The whole thing worked very well. 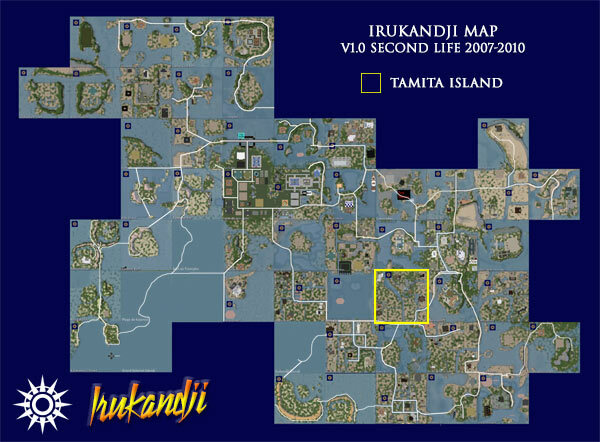 At Irukandji's peak in Second Life, 300 paying landholders from across the globe lived on the continent, with another 4000 people a week visiting the islands. Years later in InWorldz, the theme worked again. Despite a much smaller grid population, Irukandji v2 still maintained about 50 landholders, with 38,000 visitors in its first year. Now in 2017, Irukandji v3 looks like it has finally found a new and permanent home in DigiWorldz. After eight months of intense building, scripting, and testing everything that can break, the grid looks very solid and its capabilities suited to my needs. I'm in there several hours EVERY day not only rebuilding the past but expanding upon it, and in so doing, creating something completely new. Exciting times - Stay tuned :). Armed with a vivid imagination, I realised that the continent needed 'a reason to be'. Irukandji had to have a back story, otherwise it would just be another cheesy string of tropical islands. So I began to write its tales, its folklore and myths, its history. I liked the idea of Irukandji being a minor kingdom 'somewhere in the South Pacific', left to its own devices in the modern age. The story of Irukandji fully evolved; its journey through time from ancient tribalism, then as a British colony, then rebellion, independence, and civil war. I formalised the continent's title to 'The Kingdom of Irukandji', and the estate managers, including myself, became its 'Princes'. It was a kingdom without a king, which begged for another story, and that followed. We gained a police force and a navy. Various residents of long standing became Governors. New subcultures, monuments, and customs began popping up everywhere. The residents went nuts with the concept and just logging in each day became very addictive and rewarding to the imagination. Enjoy your journey through the Kingdom of Irukandji.